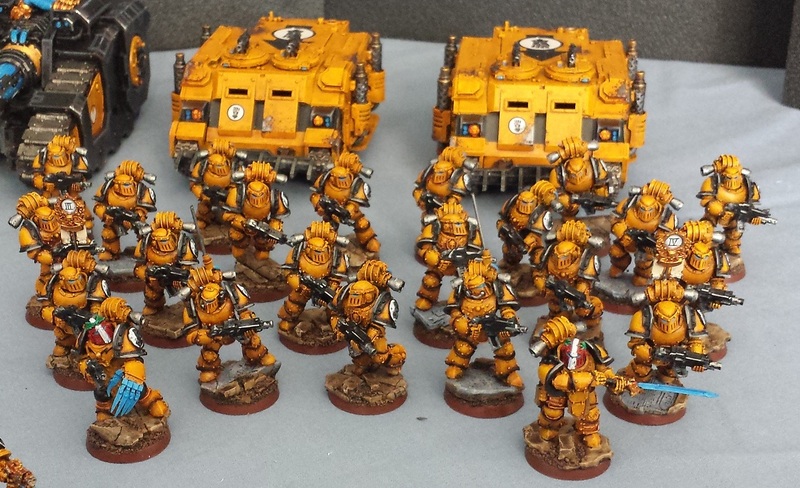 Mordian 7th Regiment: Heresy Era Imperial Fists - Army complete! Since they already had big Fist symbols on the sponson covers, I kept things fairly simple with some vehicle identifier symbols, and the legion number on the front glacis. I also went back in and brightened up the lightning on the barrels so it stands out a little better. I loved building and painting these tanks, and they will definitely find their way into future armies! The Xiphon also got a bit more decorative trim, carrying the gold/bronze theme from the other models. 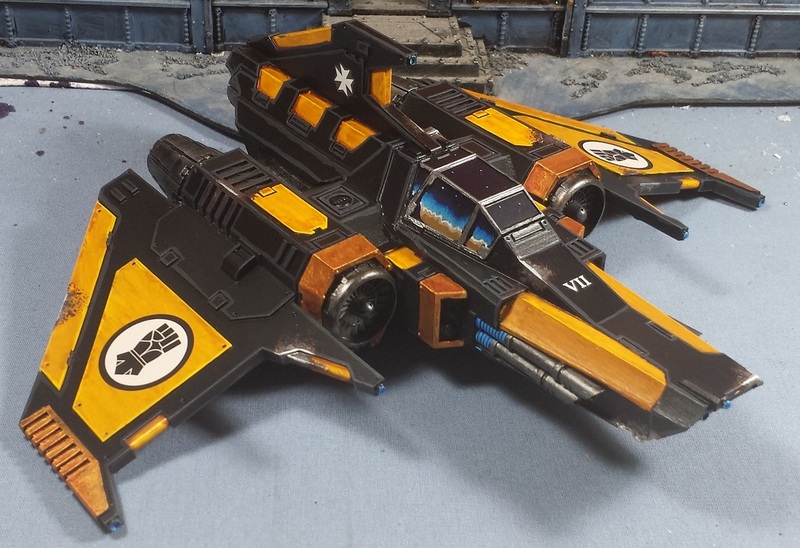 Still of two minds about this model - it was a joy to build and paint, but something about it just doesn't resonate with me in the way the new Lightning model does. It just feels a little too 'modern era' 40k to me design-wise. For future projects I'll definitely be going back to the Lightning. The resin base company I'd ordered from had a neat flying stand that matched the rest of the army, but rather than the standard clear stand it utilizes a ruined column to hold the flyer aloft. Sort of a neat idea, I thought! A bunch of characters of course, from left to right: Legion Champion, Sigismund, Forge Lord, Alexis Polux, Master of Signals, Cataphractii Praetor, Apothecary and another Praetor in Artificer armour. 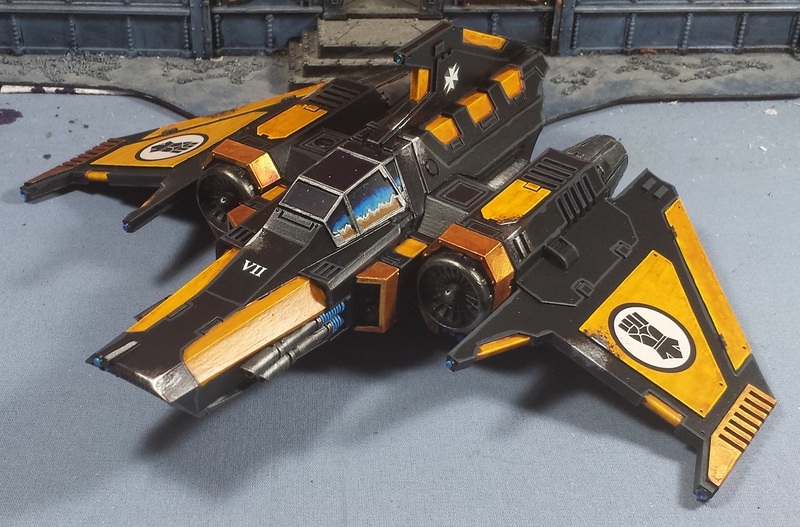 The veteran squad and their transport rhino - the heavy bolters coupled with the Imperial Fists bolter discipline means they lay down a surprising amount of highly accurate fire! Gotta have a whole mess of tactical marines, and I've set them up such that they can either be run as one big 20-man squad or as two 10-man squads with rhino transports. I'm a huge fan of the Mk.IV assault marine models, so they were a must-add for the army. ...20 of 'em may have been overkill, but there's no denying they hit like an avalanche. 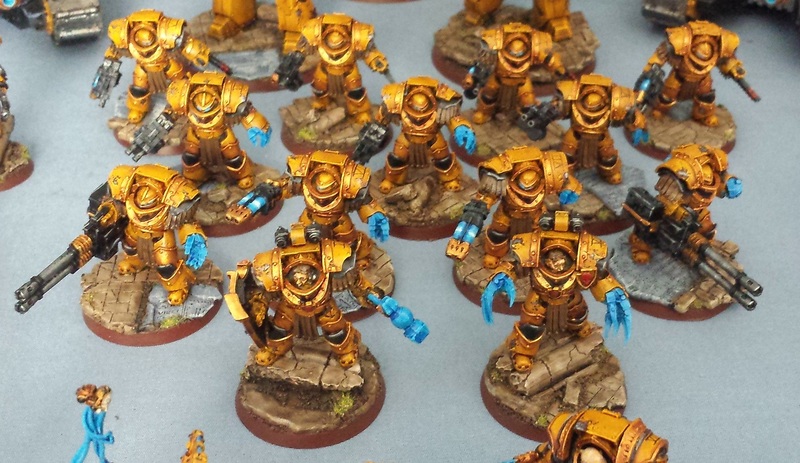 You can't have an Imperial Fists army without a mess of Terminators in my opinion. I'd intended to just do a single10-man squad, but I had enough leftover bodies to create a couple extra sergeants and heavy weapons to allow for running a pair of 5-6 man squads, or swap out the heavy weapons loadout to suit the mission at hand. A pair of Contemptor dreadnoughts, the two Venators and the Xiphon round things out nicely, and give the army some much needed anti-air and anti-vehicle punch. 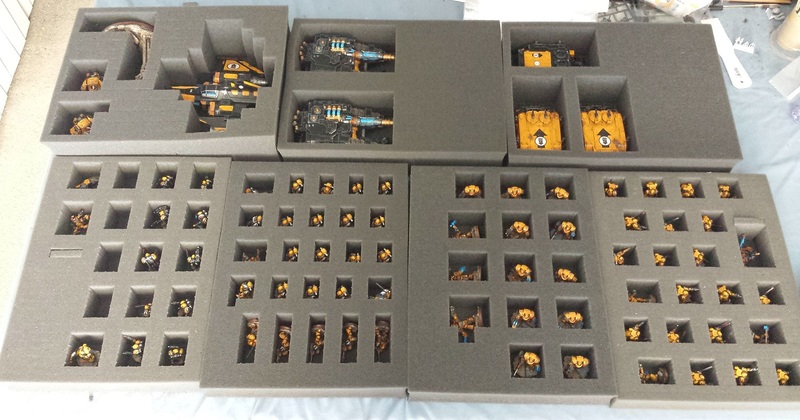 Like all of my armies, the models are all secured in Battlefoam trays for storage and transport, and have some room for future expansion. The army will be going up on eBay shortly - unfortunately due to the size and weight of the two boxes they'll be packed into, it would be ruinously expensive to ship them overseas (well over $250+) so I'm afraid it's going to be US only again. I wish that it wasn't the case, but to get any sort of delivery confirmation and tracking for overseas packages the prices are just ridiculous these days. Wow. They look good all ranked up like that. I see what you mean about the Xylophone. 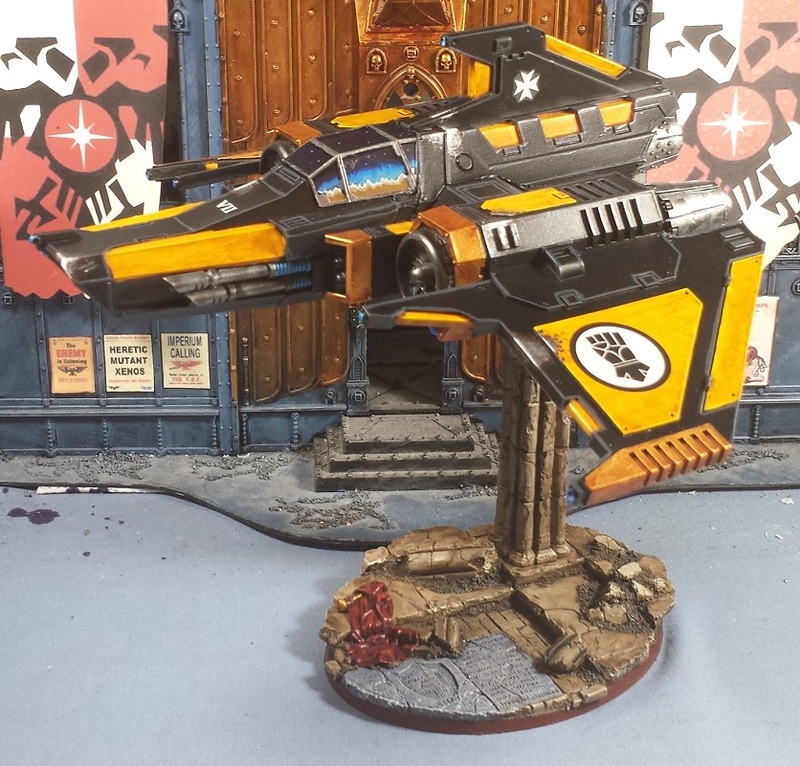 Do you think a colour scheme specifically designed for it (as opposed to one making it a part of an army) might make it more 30K ? Always cool to see an army grouped up like that thugh. Very nice look over all and Xphon is growing on me I must admit. 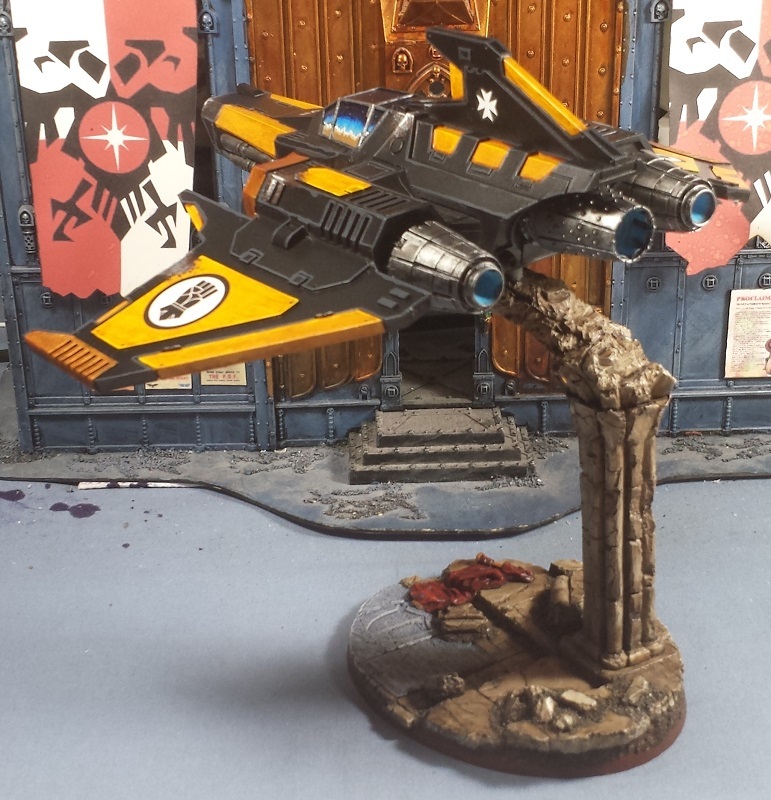 Really inspiring work, Mordian! That is an army to be proud of. @NafNaf: I appreciate it! The new Ultras minis coming from Forge World are looking pretty sweet - they're definitely in the list of possible next projects. Awesome! 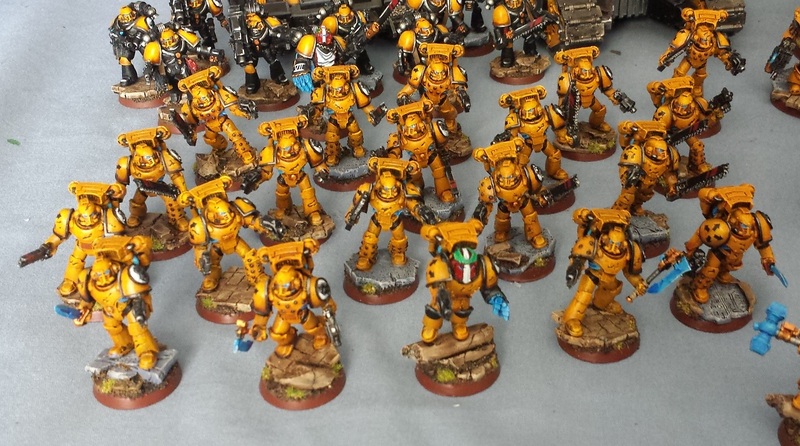 A veritable sea of yellow and black power armor, with sone excellent tanks to back them up. Bloody well done mate. This army looks so flippin cool - some lucky gamer out there is going to end up playing (We hope) with a seriously good looking force. I'm also not a fan of the flyer over the other options, though now I look at it, it does seem to have a bit of a Battlestar Galactica Viper aesthetic? Well that answers my question. I was wondering what it would cost to purchase! That's such a great army, and I really appreciate you taking the time to show it progress, and answer questions. True professional! Great work as always. What's the company you get your resin bases from? That flying stand is quite cool. @Greg Hess: I appreciate it, man! I'll generally put the armies up at around the retail cost as a starting bid, I figure between the assembly and painting any amount over that is paying for my hobby time. If it doesn't sell as an army over the next few weeks, I'll end up breaking it down and selling it off as units or smaller lots. @Courtney Hollyoake: Thanks! The bases are from Fantascape, found here: http://www.fantascape.co.uk/114-gothic-ruins - I've ordered from him a couple times now, he does great work. 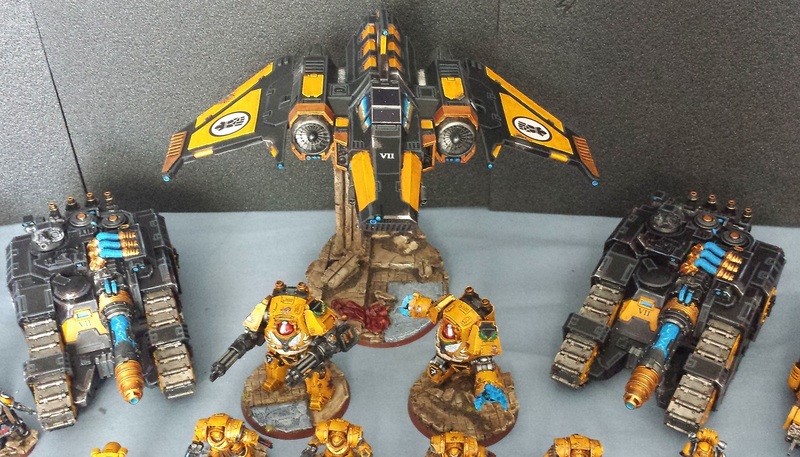 Such a fantastic looking army! You have some impressive work ethic to force yourself to finish all that and sell it off before starting the next cool thing! 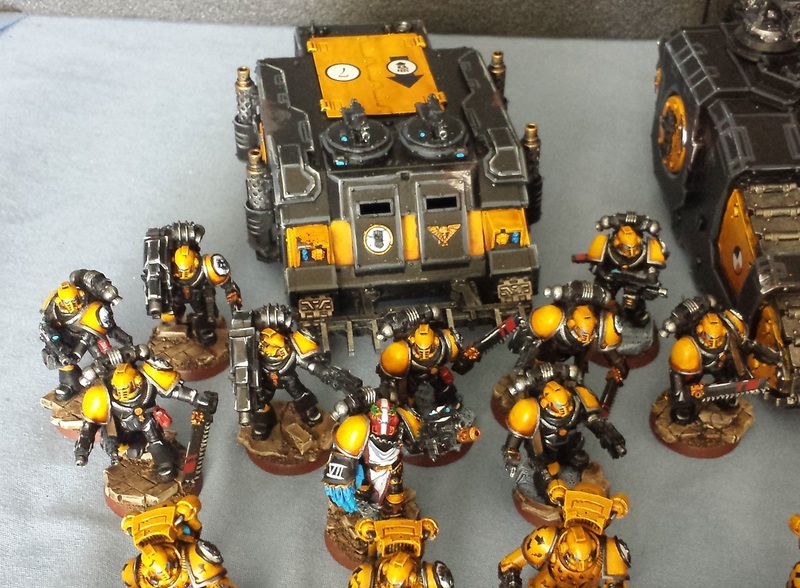 The black units really help to add interest in that sea of yellow. Hope it sells well and look forward to seeing your next amazing army!